10.10.1.1 failed its sanity check or is malformed. There is a verification failure on the IPsec packet. An incorrect packet was sent by an IPsec peer. There is a failure due to a transform set mismatch. The SA has expired or has been cleared. The pre-shared keys on the peers are mismatched. It can suppress the flooding of traffic. It conveys MAC address reachability information in a separate control protocol. It supports MAC address aging. It maps MAC address destinations to IP next hops. 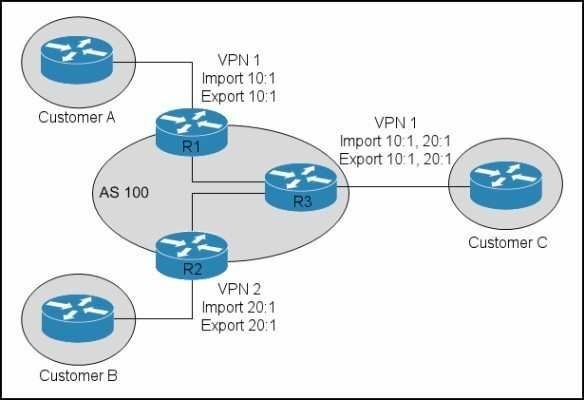 It replicates broadcast and multicast frames to multiple ports. Incorrect destination IP addresses are configured on the tunnel. The tunnel destination is being routed out of the tunnel interface. The tunnel mode and tunnel IP address are misconfigured. There is link flapping on the tunnel. There is instability in the network due to route flapping. Customer A and customer B will exchange routes with each other. R1 and R2 will receive VPN routes advertised by R3. Communication between sites in VPN1 and VPN2 will be blocked. R3 will advertise routes received from R1 to R2. Customer C will communicate with customer A and B.
IS-IS can be used only in the service provider network. IS-IS has the capability to provide address summarization between areas. IS-IS is an IETF standard. IS-IS can be used to route both IP and CLNP. IS-IS has three different levels of authentication: interface level, process level, and domain level. EVPL circuit with multiple EVCs and multiple traffic classes? NetFlow version 9 adds support for IPv6 headers. NetFlow version 9 adds support for ICMP types and codes. NetFlow version 9 adds support for MPLS labels. 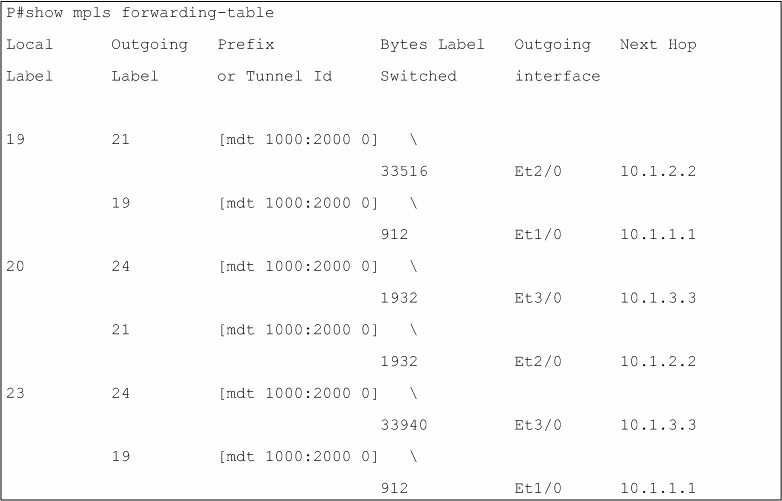 NetFlow version 9 adds support for the Type of Service field. It indicates that prefix aggregation cache export is enabled on the device. It indicates that the flows are being sent to a destination using an RFC1918 address. It was obtained with the show ip cache flow command. The fourth line shows that Version 5 is being used. It tracks the reachability of route 192.168.99.0/24. It tracks exactly 10 occurrences of route 192.168.99.0/24. It tracks the line protocol status of the interface on which route 192.168.99.0/24 is received. It tracks the summary route 192.168.99.0/24 and all routes contained within. 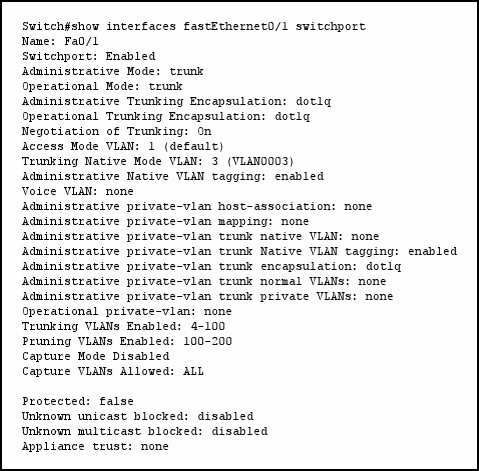 Which VLANs are permitted to send frames out port FastEthernet0/1? 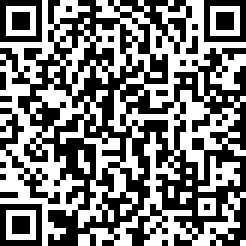 Configure the interface IP MTU. Configure the IP system MTU. Refer to the exhibit.What kind of load balancing is done on this router?